hours of camping in the square mile, together with workshops, positive alternatives and direct action. Bring a pop-up tent, smiles and ideas. A group of students have occupied B62 of LASS to demand urgent action from the University for the people of Gaza. 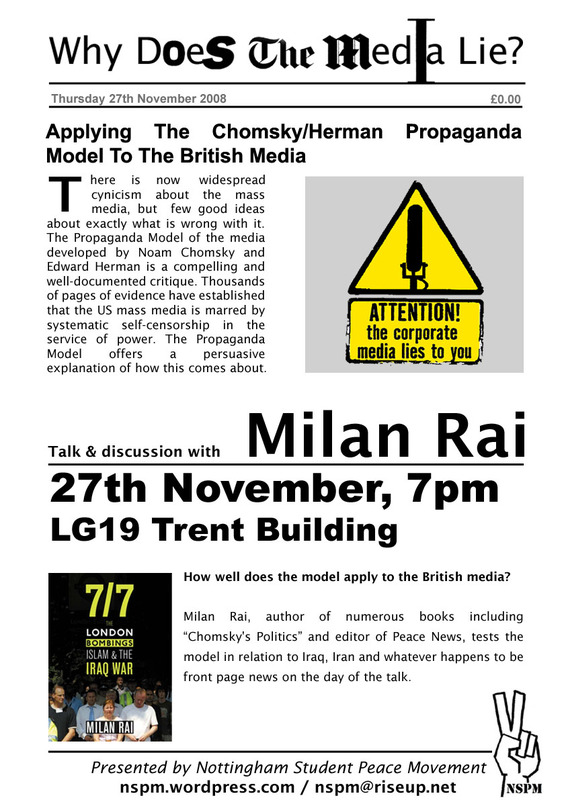 On Thursday 27th November, Milan Rai renowned author, political activistand editor of Peace News will visit the University to give a talk on corporate media propaganda. Nuclear weapon free world: Impossibility or necessity? Paul Ingram, co-director of BASIC (British American Security Information Council- http://www.basicint.org/), nuclear disarmament expert, is coming to Nottingham University on Thursday 2nd October, to give a talk on nuclear disarmament. From national security to global cooperation in a time of crisis: If we are to get through the 21st century, survive climate change and build a sustainable society we have to rebuild international relations from the bottom. And we have to start with a nuclear weapon free world. Posted on September 7, 2008 | Comments Off on Welcome to our new website!